Healthy catering in the workplace is an important part of helping staff, clients and visitors to be healthy. Workplaces may offer catering for a number of reasons, for example during meetings, conferences, events or social activities. Making sure the policies in your organisation include requirements for healthy catering is an important part of the whole of setting approach to supporting healthy eating. The Healthy Choices: healthy eating policy and catering guide for workplaces includes a healthy eating policy template that you can adapt for your organisation. If your organisation has a catering provider, follow these steps to make sure that healthy foods and drinks are provided. Who supplies catering in your workplace? First, it is important to understand who provides the catering for your workplace. Catering may be supplied by a provider (either on-site or external) or purchased by employees from a supermarket or retail outlet. Your workplace may have a contract with a preferred caterer, or may use different providers as needed. whether the contract states that healthy foods and drinks are required. It is important to make sure that any contracts with caterers clearly state that having healthy foods and drinks on the menu is a requirement and that no RED food and drinks are to be provided. If you are able to change your current contract, if your contract will soon be renewed or if you are about to sign a contract with a new supplier, you can include a service agreement in the contract which states that the catering menu needs to meet the Healthy Choices guidelines. If you have a contract with a caterer that cannot be changed and is not up for renewal, you should encourage the caterer to make healthy changes before the contract expires. The Healthy Choices: healthy eating policy and catering guide for workplaces has many healthy catering ideas, and includes a Healthy catering guide and sample menus to help you provide healthy foods and drinks at meetings and events. Many caterers have healthier meals, snacks and drinks that meet the Healthy Choices guidelines, so be sure to ask your caterer about their healthier options. For more ideas, visit Simple changes for healthy catering or research ‘healthy workplace catering’ online. If your caterer would like more information about providing healthy foods and drinks, you can encourage them to visit the Food outlets and caterers section of this website or contact the Healthy Eating Advisory Service. Find out how the food and drinks you offer through catering are rated against the Healthy Choices guidelines, with a free online menu assessment. If your catering menu doesn’t have any RED items in it, you might be eligible for Healthy Choices marketing material. What if catering is purchased by staff from a supermarket or retail outlet? If catering is bought by employees from a supermarket or local retail outlet, make sure they are aware that the organisation will only pay for catering that is in line with organisational policy. Having a list of recommended healthy options is helpful, and this list should be included in your organisation’s policy about healthy catering. The policy should also outline products that cannot be offered due to dietary requirements (e.g. allergies). For healthy catering ideas refer to Section 4 of the Healthy Choices: healthy eating policy and catering guide for workplaces, or the factsheet Simple changes for healthier food and drinks. You can also contact your local council to check whether a healthy catering guide has been developed in your area. 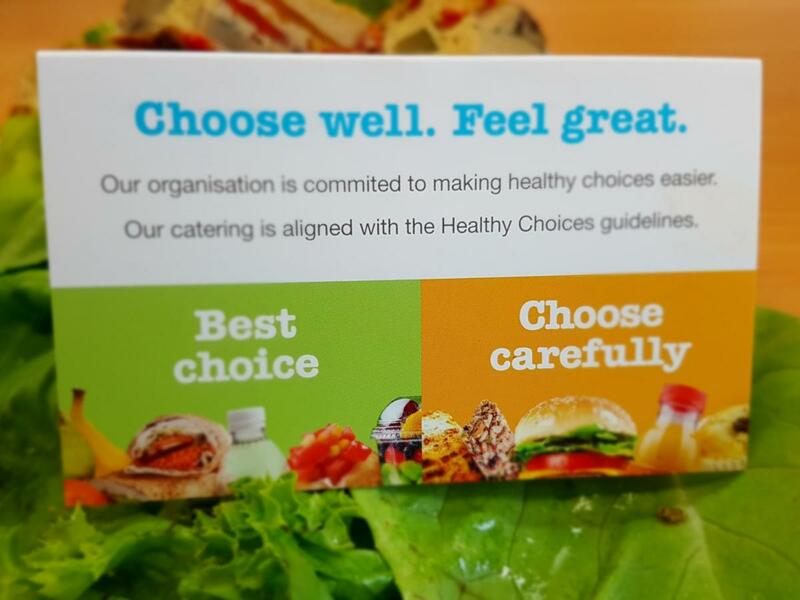 Healthy catering guides include menus from local caterers, with foods and drinks labelled as GREEN (best choices) or AMBER (choose carefully) according to the Healthy Choices guidelines.